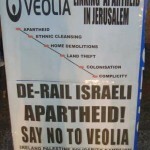 The Ireland-Palestine Solidarity Campaign welcomes the news that, more than a decade after winning the tender for the construction and operation of the Jerusalem Light Rail (JLR) which serves illegal Israeli colonial settlements in occupied Palestinian East Jerusalem, Veolia’s subsidiary, Transdev, has divested itself from the Israeli market. As the website of the Israeli anti-occupation group Who Profits notes: “The approval of the deal by the Israeli authorities and the completion of the ownership transfer, earlier this month, mark an end to Veolia’s operations in the Israeli market in general and to its involvement in the controversial JLR project in particular.” However it is unlikely the stench due to its association with these crimes will every truly wash off. Veolia had long been the focus of the global Boycott, Divestment and Sanctions (BDS) campaign which aims to compel Israel to end its occupation of Palestine, observe international law and grant Palestinians their rights. Over ten years the company lost a host of contracts, in total worth billions of dollars, all over the world due to campaigning by BDS activists. As part of this internationally coordinated Divestment campaign, the Ireland-Palestine Solidarity Campaign has worked for years on the issue of Veolia’s complicity in international law violations, staging numerous protests, and initiating successful public lobbying campaigns to encourage local councils to support motions sanctioning Veolia for their illegal actions. Dublin, Cork, Galway, Castlebar, Sligo, Donegal and other town and county councils all passed motions vowing not to renew contracts with Veolia as long as it was involved in Israeli international law violations. 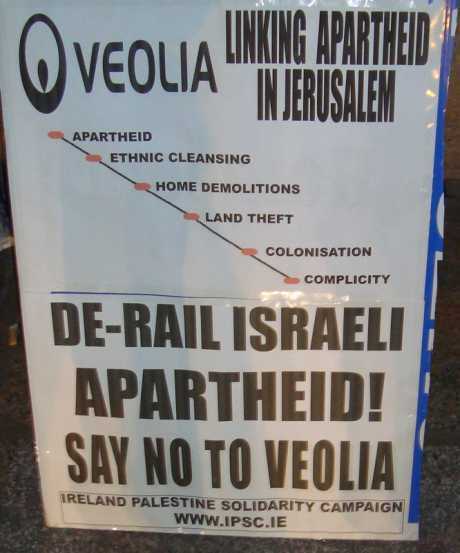 There was strong opposition to Veolia’s actions in occupied Palestine even amongst workers for the company in Ireland. 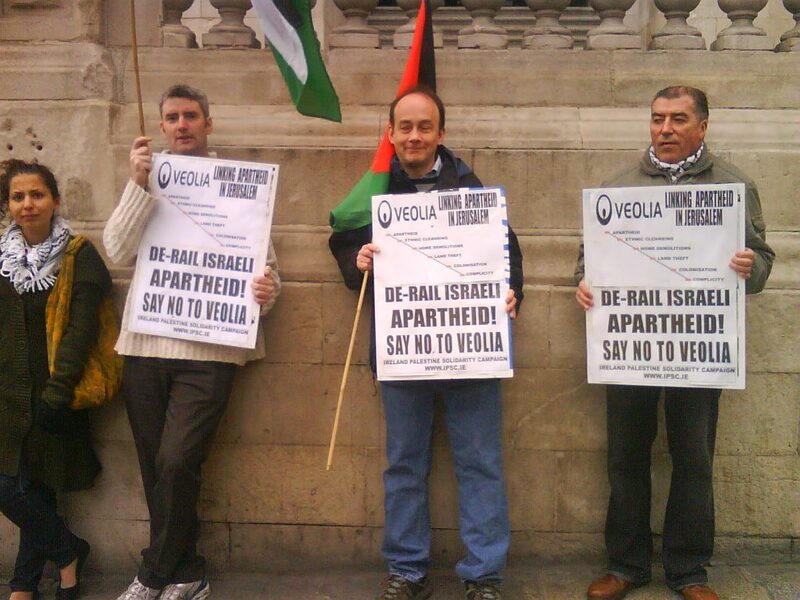 For example in 2006, Veolia drivers in Dublin refused to train Israeli colleagues in an act of solidarity with Palestinians, as these drivers would be operating in illegal settlements. Drivers in Dublin would also often turn a blind eye when IPSC campaigners leafletted people on the trams informing them of Veolia’s complicity in international law violations. More than a decade after winning the tender for the construction and operation of the Jerusalem Light Rail (JLR), Veolia Environnement’s subsidiary, Transdev, has sold all of its holdings in the JLR to a group of Israeli investors. The approval of the deal by the Israeli authorities and the completion of the ownership transfer, earlier this month, mark an end to Veolia’s operations in the Israeli market in general and to its involvement in the controversial JLR project in particular. Until August 2015, Trasndev, a Veolia Environnement subsidiary, held a minority interest (5%) in CityPass, a consortium tendered by the Israeli government to build the JLR, as well as full ownership (100%) of the train’s operator – Connex Jerusalem. The JLR was designed to connect the western part of Jerusalem with the illegal settlements surrounding the city. Operational since December 2011, the JLR crosses the Green Line and passes through the Palestinian neighborhoods of Shuafat and Beit Hanina. On September 2nd 2014, Transdev (formerly: Veolia Transdev) signed a contract with the CityPass consortium for the sale of Connex Jerusalem and Transdev’s remaining 5% share in CityPass. The buyer, CityPass consortium, consists of three Israeli shareholders: The Ashtrom Group, IIF – Israel Infrastructure Fund and Harel Insurance. Recent findings by Who Profits Research Center indicate that after almost a year- long negotiations between the companies, the Israeli authorities and the funding banks, the September deal was fulfilled and that the sale of Connex Jerusalem together with the 5% of CityPass shares reached completion. On August 6th 2015, the Ashtrom Group – one of the buyers and a shareholder in CityPass, reported to the Israeli Stock Exchange that all conditions precedent in the JLR sale agreement with Transdev were fulfilled and that the agreement was completed. Ashtrom’s report also mentioned that on the same date, 1% of CityPass shares’ was passed into Ashtrom’s possession. For further information on the deal and necessary approvals, see Who Profits’ update from February 2014. Later that month, on August 18th 2015, and according to the Israeli Companies’ Registrar, 100% of Connex Jerusalem shares’ were transferred from Transdev to an Israeli holding company jointly owned by the Ashtrom Group, IIF and Harel Insurance. According to the Registrar however, Transdev 5% share in CityPass still remained. The Israeli financial newspaper – the Marker – has also confirmed the completion of the deal on August 2015. In an article (available in Hebrew(link is external)), published on August 20th 2015, it was reported that Transdev received NIS 100 million for Connex Jerusalem. Contrary to Ashtrom’s report to the Israeli Stock Exchange and to the unaltered status of CityPass ownership in the Israeli Companies’ Registrar, The Marker reported that Trandev’s 5% share in CityPass was fully sold to IIF. Who Profits will continue to monitor the publications around the sale in order to determine which company is the current owner of Transdev’s former 5% share in CityPass. Finally, Who Profits findings and analysis strongly suggest that the sale has been completed and that the formal ownership transfer of CityPass shares will show on public record. The sale of the JLR is the final step in Veolia’s gradual withdrawal from the Israeli market and several illegal operations in the occupied Palestinian territory. Through its various Israeli subsidiaries, the company has engaged in multiple sectors of the local economy, including transportation, water, waste management and energy. Since the Israeli private sector, much like the Israeli government, considers the settlements as a legitimate part of Israel, Veolia’s Israeli subsidiaries operated freely beyond the Green Line. Their activities included the provision of public bus services to Israeli settlements in the West Bank, the operation of a landfill in the occupied Jordan Valley, wastewater treatment facility for settlements’ sewage, and finally the construction and operation of the controversial JLR. In the last few years, Veolia Environnement sold its Israeli subsidiaries piecemeal. In September 2013, the company sold its local bus services subsidiary to Afikim Company and in April 2015,water, waste and energy activities in Israel were also sold to the US-based investment firm Oaktree Capital Management. At the same time, Veolia tried to distance itself from the JLR by decreasing its holdings in Veolia Transportation – the multinational’s transport services division. In 2011, Veolia Transportation was merged with Transdev UK, leaving Veolia with a 50% share in the new company. To further blur Veolia’s involvement in the JLR, the new subsidiary – Veolia Transdev, changed its name to Transdev. Simultaneously, Veolia negotiated with the Israeli Ministry of Transportation its way out of Jerusalem. In 2010, the Ministry has effectively blocked Veolia’s attempts to sell its holdings in the light rail to the local Egged Company. It did so by demanding previous international experience form the replacing operator. Due to the controversy surrounding the light rail, it appeared that international companies were hesitant to take on Veolia’s role, additionally with an unexperienced local transportation sector, Veolia was unable to sell Connex Jerusalem and its minority share in CityPass for years. Apparently, negotiations have now ended with the removal of the Israeli government’s objection to an unexperienced buyer and the acceptance of the CityPass consortium as capable rail operator. As of August 2015, Veolia Environnement is no longer active in the Israeli market and in the occupied Palestinian territory. Nevertheless, the company has left behind irreversible facts on the ground. The construction of the railway involved the expropriation of occupied land that was not done for the benefit of the occupied population, and hence contradicts international law and the Fourth Geneva Convention. The JLR continues to serve the Jewish settlement neighborhoods in occupied East Jerusalem and passes daily through the Palestinian neighborhoods of Beit Hanina and Shuafat, by doing so it will play a substantial role in the reinforcement of Israeli sovereignty over occupied East Jerusalem for years to come. Only after a final determination of the owner of Transdev’s former 5% share in CityPass, Who Profits Research Center will remove the profiles of Veolia Environnement, Transdev and Caisse des Dépôts et Consignations(CDC) from its database. Posted August 28, 2015 in BDS, BNC, Divestment, Human Rights, Jerusalem, National Rights, Political Rights, Press releases, Settlements, Statements, Veolia, War Crimes, West Bank.